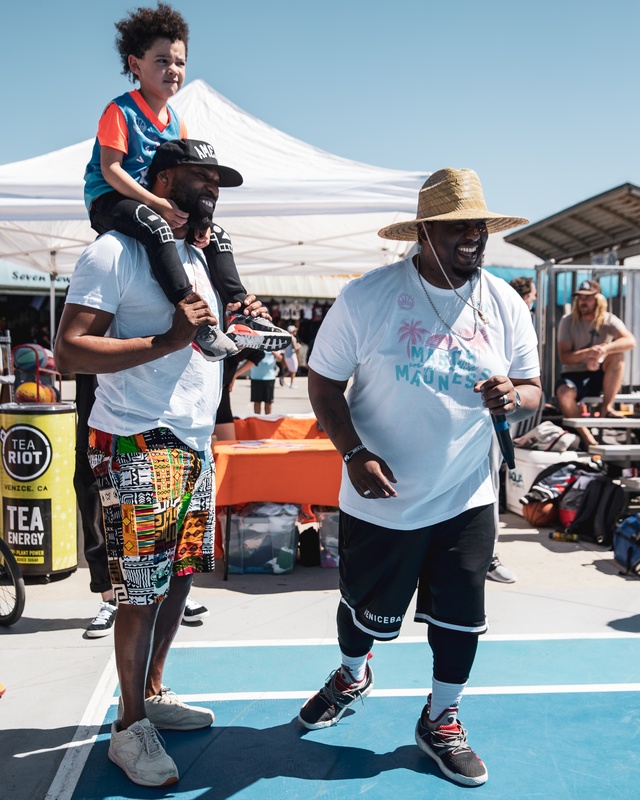 The day-long event brought out legendary NBA and WNBA players Baron Davis and Cappie Pondexter, who coached the kids’ clinic, as well as current NBA stars Montrez Harrell and Sindarius Thornwell. Throw in a surprise guest appearance from legendary street hooper, Hot Sauce, and you’ve got more action than an entire NCAA tournament. Yeah, it was the best day ever. Things tipped-off with an intense 3×3 tournament, the latest craze in basketball’s evolution. The event was won by the monstrous trio of high-flying, former Globetrotter Chris Staples, seven-foot-six-inch Mamadou N’Diaye, and the lanky and athletic Adam Stanford. As the 3×3 action segued into a 1×1 King and Queen of the Court competition, you could feel the energy start to grow; more and more tourists crowded deeper and deeper around the beautifully painted basketball court. Although in season, Montrez Harrell decided to partake, lightheartedly, in a spirited 1×1 battle against Chinese viral sensation Soy Sauce — a spiritual descendant of Hot Sauce from the other side of the world. After crowning the King and Queen, it was time for the main event, the All-Star Game. At this point the crowd had swelled to epic proportions, reminiscent of the throngs at Rucker when Julius Erving and Wilt Chamberlin played. The tone was set early by Buddha and Farnold Degand and the teams were deadlocked going into halftime. with a sequence of moves that left him lost in the sauce; at one point, a fake shot completely turned Soy around as the entire beach watched the ball fall calmly back into Sik’s hands. The crowd went wild and stopped the game. 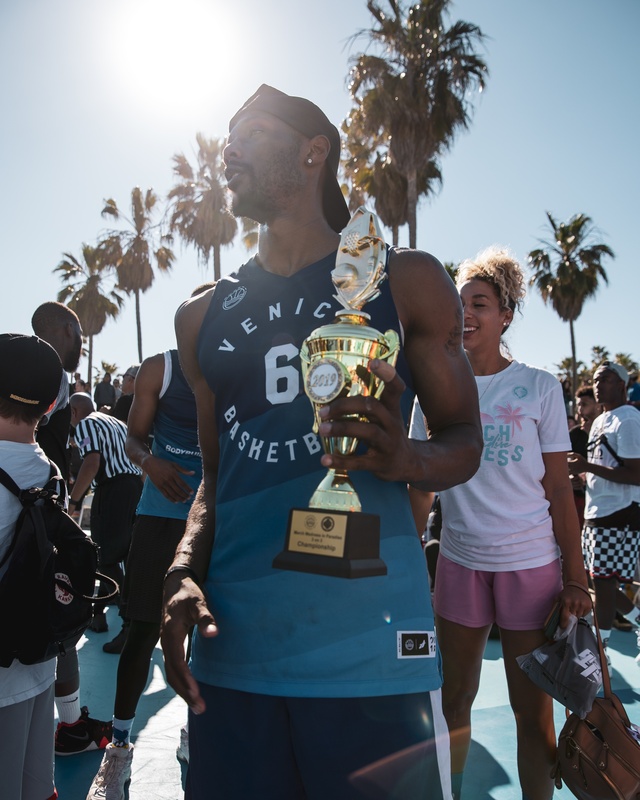 When the action resumed, the Venice Beach League duo of White Iverson and former NCAA dunk champ, Garrick Wilson, took over with a video-game-like montage of crossovers, shots, alley-oops, and dunks. The final of which — Wilson catching a lob from Iverson and slamming it down over a Chinese All-Star defender — sent the crowd in hysteria. March Madness in Paradise, ladies and gentleman.